In preparation for the launch of the iPad tomorrow, iPad Apps are live in iTunes and we’re sorting through the best ones as fast as we can. But with more than 2,000 iPad apps in the App Store, the choices are already daunting. To help you find the best apps at launch, we’ve put together the definitive list below. It includes all the iPad apps reviewed on TechCrunch, as well as other promising ones we have not gotten to yet. If you have a favorite you think should go on this list, tell us why in comments. Apple’s answer to the Amazon Kindle, iBooks turns the iPad into an electronic book reader with 60,000 books at launch to choose from (the app is free, the e-books are not). Although the Kindle has many more titles (450,000), iBooks lets you flip through virtual pages with your fingers on a color screen. The built-in search and dictionary will come in handy. The font size and brightness can be adjusted. Pages can be bookmarked or highlighted. Books can be read vertically in a full-page view or horizontally in a two-page view like a regular open book. The book store is part of the app and looks like iTunes for books, with best-seller and most-popular lists. Every time you buy a book, it downloads directly to your iPad. Not to be outdone by Apple’s iBooks app, Amazon released its own Kindle app for the iPad which nearly matches the iBook app feature for feature: Full-color touchscreen app, animated page-turning, adjustable font size and brightness (plus you can change the background color), portrait or landscape mode, and the ability to buy books right from the app. Of course, Amazon has a lot more books to choose from (450,000 vs. 60,000). (Search and dictionary functions are “coming soon.” It also includes Amazon’s Whispersync technology, which lets you pick up where you left off on your regular Kindle, your iPhone Kindle App, Blackberry, Mac, or PC. And the Kindle store includes all the regular customer reviews you can find on Amazon’s site. Let the digital book battle begin. From our post: “The iPad may be better suited for planning events around location, rather than actively participating in location. With Loopt Pulse, you load up the main screen to see where you are and everything that’s going on around you. On the left side of the screen you get a list of places, and on the right, you can see each of those places on a map and more details about them. TweetDeck’s iPad offering is very similar to its popular desktop stream reader. You can split up your Twitter and Facebook streams into different columns, and swipe across to see more or up and down to read through them. You can compose Tweets using the iPad’s touchscreen keyboard. One new feature is a map showing all the geo-tagged Tweets from the people you follow. It looks gorgeous. Watch the demo video. This may just be the best app in the iTunes store. It turns your iPad into a Captain’s Log from Star Trek. You can add your own notes, or use it to post updates to both Twitter and Facebook. This app may not have all the bells and whistles you’ll find in TweetDeck, but it will make you feel like a Starship captain. It’s so retro, yet so futuristic. From our post: “The app, which is similar in features to its sister iPhone app, is essentially a tabbed digital cookbook which allows you to access 27,000 recipes from both Gourmet and Bon Appetit. You can browse recipe collections, search via keyword, and filter your searches by what’s in your fridge, seasonal foods, holidays and more. You can add any recipe to your favorites box to save it as well as email recipes to yourself and others. A limited version of the paper with all of its free articles. Subscribers get the full paper. The iPad app mimics the look of the paper edition, and also includes market data, videos, and photo slideshows. Subscribers get to download a week’s worth of articles for later reading. From our post: Gilt Groupe’s sales on luxury goods on its properties, including Gilt, Gilt Fuse, and Gilt Man, can all be accessed directly from the app. The app allows you to receive real-time sale alerts, check upcoming sales and receive an instant Gilt membership when you download the app. The app’s shopping cart, that is always visible, allows members to quickly touch and drag desired items into their cart. ABC’s free episode player for the iPad streams ad-supported videos from the network’s roster of shows. You can watch full length episodes of select shows from the network including Lost, Grey’s Anatomy, and Modern Family. You can also browse through shows and episodes, pause an episode, watch it later and see your viewing history. The videos stream into a player that takes up the top half of the screen, while letting you browse other episodes along the bottom. (Presumably, there is a full-screen option as well). Kayak is one of the more useful travel search engines on the web, and its iPad app brings the same functionality to the tablet device. The app lets you compare prices for flights from Priceline, Expedia, Travelocity, Hotwire and airline sites. Plus the app will save your search history, map your searches, and allows you to book directly from the app. NPR’s iPad app is similar to its iPhone app, in that it features links to NPR programs and over 1,000 member-station streams, allowing you to browse news stories and listen to programs at the same time. The NPR website has been modified for the iPad to support HTML5 and includes an audio player at the bottom of the screen so you can listen to media easily. Scrabble’s iPad app features a more animated and entertaining vesion of its iPhone app, letting you connect with friends on Facebook and play up to 25 Scrabble games at once. And as you are playing, the app’s Teacher Feature will let you see what the best word choice was from your previous turn. From our post: Square comes with a peripheral credit card swiper that lets any store or business person take credit card (or cash) payments on iPhones, and now, iPads. It takes finger signatures on the touchscreen, generates email or SMS receipts, calculates sales tax, and comes with an online accounting dashboard to keep track of sales. From our post: This isn’t an app you get from the App Store — it’s a web app. Just head to Gmail.com from your iPad and you’ll automatically be directed to this optimized version of Gmail. 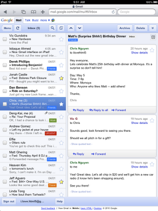 The HTML5-based site, which is automatically activated when you visit Gmail.com from device, features a slick looking two-column view, with a list of messages in the left column and message content on the right. From our post: Amazon’s second iPad app for the Kindle is an optimized version of its IMDb (Internet Movie Database) iPhone app. According to the company, the IMDb Movies & TV App for iPad lets customers access more than 1.5 million movie and TV titles with information on 3.2 million celebrities, actors, actresses, directors and crew members. Users can also use the app to watch movie trailers in HD, find localized movie showtimes in the United States, browse photo galleries and shop for DVD and Blu-ray releases. The app is free of charge – it hasn’t garnered any reviews on iTunes so far. From our post: The app aims to simulate reading your local newspaper. Fwix’s app allows you to view news stories in a map format, showing you the exact geographic location of news. You can access news by your location and then filter stories by subject (i.e. sports, arts, politics, crime). And you can share all content on Facebook, Twitter or via email.